After arriving in Nepal, I went for a lovely lunch with the local CECI staff and then had a chance to visit their offices and meet the rest of the staff. 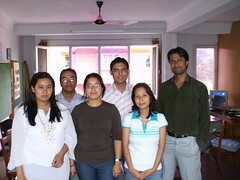 Everyone is wonderful, and it was great to begin to meet my colleagues in Nepal. I started some of the excellent orientation sessions, but by about 3pm I was fading quickly, and Geetika, my program officer, took pity on me and sent me back to my hotel. I slept from about 4pm until 7am the next day…this was a very good thing. My sleep schedule was reset by doing this. So while I am feeling some jetlag and get sleepy throughout the day, overall it isn’t so bad. 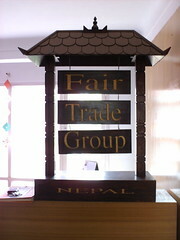 The next day I returned to the CECI office and continued my orientation, and then went to the Fair Trade Group Nepal office for the first time, which is the organization I am volunteering with. After introductions, we discussed my schedule (10-5:30 Sun-Fri) and the travel I am hoping to do. FTG Nepal was very gracious in agreeing to some flexibility in my schedule to accomodate some short trips I hope to make. Once Geetika left, I went for lunch with the FTG Nepal staff at a lovely restaurant nearby the office (I think it was called The Downtown Restaurant and is on Powlchowk Road in Patan). I had the best Aloo Gobi (spiced potoates and cauliflower) I’ve ever tasted there, and had Saag Paneer(pureed spinach and a type of local cheese) which – for the first time – I liked. We also had some sweet and sour tofu; Chinese cuisine is very common in Kathmandu restaurants. To round out the meal we had baskets full of the most amazing naan bread and momos, which are a local type of dumpling; we had vegetable, which tasted very much like samosas, and chicked, which reminded me of chinese wanton dumplings. They were both excellent. Sorry, no pictures of my lunch…I totally forgot! But don’t worry…I do have food pictures coming up soon. 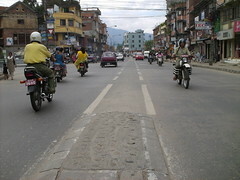 Walking back to the office, we visited some of the stores for the member organizations of FTG Nepal. It was wonderful to be able to meet the people working there and actually see and hold the products these amazing groups make. 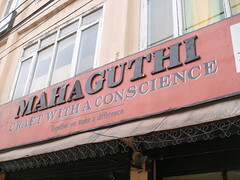 Here is a picture of one of these stores, Mahaguthi – I’ll go back and try and get some pictures of the products themselves as well. Once we returned to the office we discussed what work I will be doing. My current focus is on wrapping up a needs assessment and technical assessment of the FTG Nepal website and then to begin developing content development training for the FTG Nepal staff. I’ve had an absolutely lovely time since I’ve been at the FTG Nepal office. Everyone is very nice and working there is great. 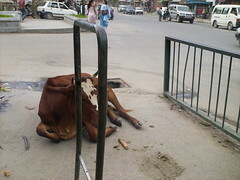 Here are some pictures of FTG Nepal and the staff there. In the morning, when I find my notes, I’ll add names to the pictures. Well, it’s absolutely pouring rain here now…11:05pm local time. I’m going to sprint across the courtyard, from the Internet café here back to my room and head to bed. See you tomorrow! Glad you’re on the ground, safe and sound. And thanks for the food, um, descriptions. You are like some kind of crazy behemoth! Much better way to deal with the thumbnail pics. Good job there. And good job with the food descriptions! 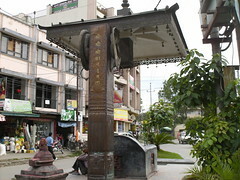 you made it to Nepal!!!!!!! So all is well , so far! I am sure that the rest of your Leave for Change will be as good as its beginning. I am just back today from holidays and you made my day. Aurevoir!